A comprehensive guide to DC stories that don’t take place on their main-continuity Earth – including Alternate Earths, Elseworlds, Inter-Company Crossover, TV and Video Game tie-ins, and more! Find out how to read them via omnibuses, hardcovers, and trade paperbacks. Part of Crushing Krisis’s Crushing Comics. Last updated April 2017 with titles scheduled for release through December 2017. This alternate reality was spun off after Infinite Crisis and should not be confused with the “Earth-1” of Silver Age stories. On this Earth we get to watch as superheroes emerge for the first time into an unsuspecting world via a series of full-length original graphic novels by superstar creators. 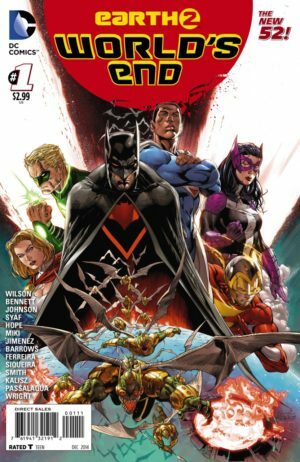 The new origins are surprisingly not an all-new spin on the stories or simply a modern update of the characters, with the exception of Teen Titans. Each solo hero’s adventures have been devoted to capturing the essence of their origins with a few distinct pivot points to ground the stories more in reality, like baby Superman’s ship being spotted by the military or Wonder Woman being completely disoriented by the human’s world. By contrast, Teen Titans presents a much more connected team of youth’s discovering their powers in the spirit of X-Men rather than a group of sidekicks, which would make much less sense on this hero-lite Earth. A team of Changeling, Cyborg, Starfire, Terra, and Raven, amongst others, written by Jeff Lemire, penciled by Terry Dodson and inked by Rachel Dodson and Cam Smith. Written by Grant Morrison with line art by Yanick Paquette. 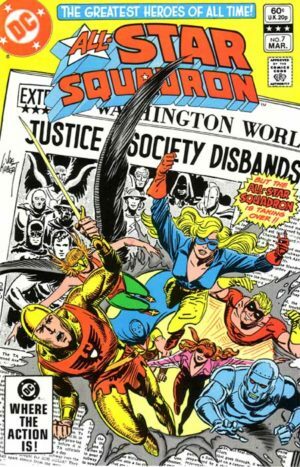 Prior to Crisis on Infinite Earths, “Earth Two” referred to DC’s Golden Age characters and continuity, largely held separate from Silver Age incarnations and acting as the continuing home to the vintage Justice Society of America. 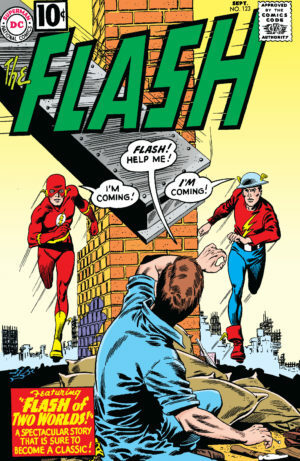 Most of those Golden Age characters had been retired between 1956 and 1961, but began to reappear in classic infinite earth crossover stories in Flash (1959). Eventually, they were given their own series in All-Star Squadron. Note that this section does not cover any original Golden Age Earth Two stories – only Earth Two stories after the split of those characters from the main DC reality at the start of the Silver Age. As I encounter more Earth Two stories and collections, I’ll continue to add them here. Feel free to leave a comment if you’re aware of one I should add! Infinity, Inc #18-19, Annual 1, 21-27: Not collected. Issue #21 continues to Crisis on Infinite Earths #5. New 52 introduced a completely new version of the Earth, though some characters with familiar names remained (i.e., Jay Garrick as Flash, Alan Scott as Green Lantern). 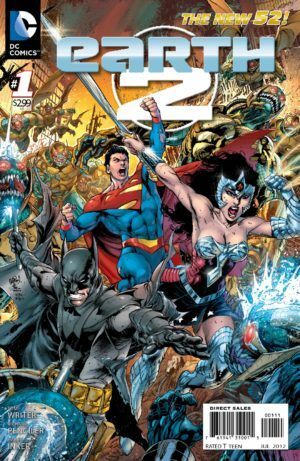 In the New 52 Earth 2, DC’s trinity of Wonder Woman, Batman, and Superman have been defeated, leaving a power vacuum in Earth’s defense against super-powered villains and extra-terrestrial invaders. Explored first by the history-mining James Robinson and then by Tom Taylor hot off in Injustice, this Earth could approach more controversial story beats than the main continuity – whether that’s killing heroes or recasting them with new demographics. 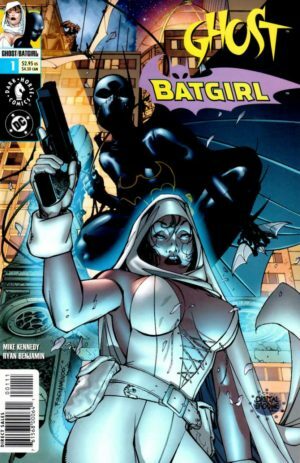 It also spun off a Huntress and Power Girl back into DC’s main continuity. These are the stories that established DC’s Infinite Earths for Crisis to destroy! First, a series of one-off stories established the connection to alternate earths, including the Golden Age Earth Two! Then, the Justice League of America repeatedly crossed over to other earths throughout their classic 1960 series. Collects Justice League of America (1960) #21-22, 29-30, 37-38, & 46-47. Collects Justice League of America (1960) #55-56, 64-65, 72-73, & 83-84. Collects Justice League of America (1960) #91-92, 100-102, 107-108, & 113. CollectsJustice League of America (1960) #122-124, #135-137 and #147-148. DC’s Greatest Imaginary Stories: 11 Tales You Never Expected to See! In 1989, DC created the Elseworlds imprint under which they could publish out-of-continuity stories, mini-series, and original graphic novels. 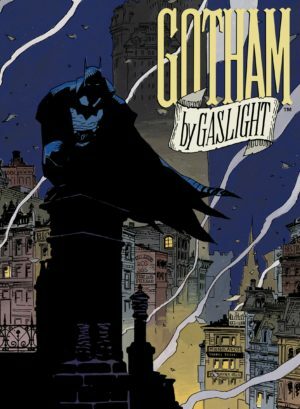 The concept was introduced by the Victorian-era tale Batman: Gotham by Gaslight in 1989, that original release did not bear the “Elseworlds” imprint. The imprint wound down in 2003. DC has begun to comprehensively collect their Elseworlds material! This section only addresses collected editions that gather multiple Elseworlds series or OGN in a single collection. For any original collections of single series, see the list of series below. Collects Conjurors #1-3, Flashpoint #1-3, JLA: Act Of God #1-3, Superman’s Metropolis #1, Batman: Nosferatu #1 and Wonder Woman: Blue Amazon #1. This book may be cancelled or indefinitely delayed. Collects Superman: Speeding Bullet #1, Kamandi: At Earth’s End #1-6, Superman: Kal #1, Superman: At Earth’s End #1, Superman/Batman Doom Link #1 and Superman/Wonder Woman: Whom Gods Destroy #1-4. Collects JLA: The Nail #1-3 and JLA: Another Nail #1-3. Collects four of the Elseworlds Annuals from the 1994 linewide annuals theme – Action Comics (1938) Annual 6. Batman: Legends of the Dark Knight (1989) Annual 4, Detective Comics (1937) Annual 7, and Steel (1994) Annual 1. See DC Universe Events for more information. Batman: Book of the Dead (1999) #1-2: Not collected. Prestige format. Planetary/JLA: Terra Occulta (2002): See DC/Image, below. The cover reads: Superman: Man of Steel co-starring Batman. A Superman/Batman story included with Kenner Toys. Collects Superman and Batman: World’s Funnest #1; Batman: Mitefall #1; Batman and Superman: World’s Finest #6; Superman/Batman #51-52; The Brave and The Bold #200; Detective Comics #267 & 482; Superman (Vol. 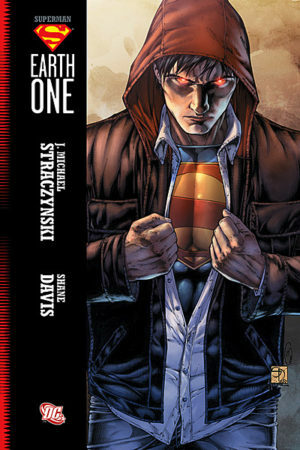 1) #30; Superman (Vol. 2) #11 & 31; World’s Finest #113; and Batman: Legends Of The Dark Knight #38. Superman/Tarzan: Sons of the Jungle (2001) #1-3: See below in DC/Dark Horse Crossovers. 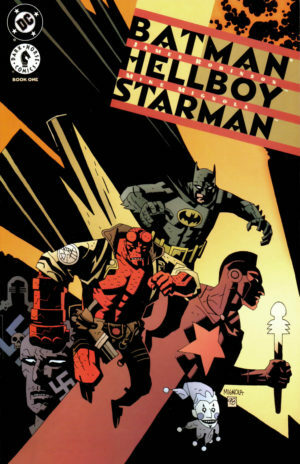 DC’s crossovers with Dark Horse are unique in that Dark Horse Comics is not a single, unified comics universe – it’s made up of many different licensed characters and worlds. While some of them seem to have found a permanent home at Dark Horse (Hellboy, Madman), others based on outside media properties (Aliens, Predator, Tarzan, Terminator, etc) could eventually depart for other publishers as Star Wars did in 2015. This section only addresses collected editions that gather multiple DC/Dark Horse crossovers! For any original collections of single series, see the list of series below. Batman/Aliens (1997) #1-2, Batman/Aliens II (2002) #1-3, Superman and Batman Vs. Aliens and Predator (2007) #1-2, and WildC.A.T.s/Aliens (1998) #1 – which was not a DC book when it was released, prior to the Wildstorm acquisition. 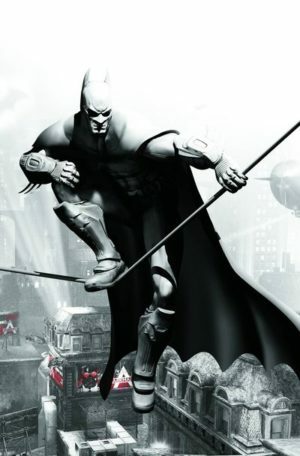 This section covers DC crossovers with various current and former Image Comics studios, including (but not limited to) McFarlane Productions, Top Cow, and Wildstorm. Note that this does not address every crossover of DC and Wildstorm past Mr. Majestic’s initial DC appearance in 2004, as Wildstorm was wholly-owned by DC at that point and crossovers become more common (though its characters continued in a separate continuity through 2011). Collects the crossover that introduced Majestic to DC Comics from Action Comics (1938) #811. Adventures of Superman (1987) #624, and Superman (1987) #201, plus Majestic #1-4. Spawn-Batman (1994) One Shot: Not collected. Note that this is different than the 2004 “War Devil” OGN. 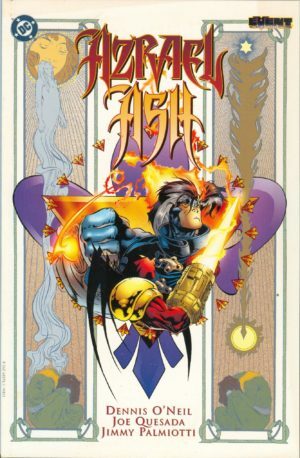 These one-shots were published as a special event in both 1996 and 1997 and have been collected in their entirety in a series of four volumes. The 1996 event occurs between issues #3-4 of DC Versus Marvel/Marvel Versus DC (1996), which is in the DC/Marvel section, below. If you buy the following volumes, you will have all of DC and Marvel’s official crossovers except for one OGN – 2000’s Batman/Daredevil: King of New York OGN – and a pair of mid-90s full-line crossover limited series (All Access and Unlimited Access). Collects four mid-90s crossover – Batman/Punisher: Lake of Fire OGN (1994), Punisher/Batman: Deadly Knights OGN (1994), Batman & Captain America OGN (1996) by John Byrne, and Silver Surfer/Superman (1996) #1. 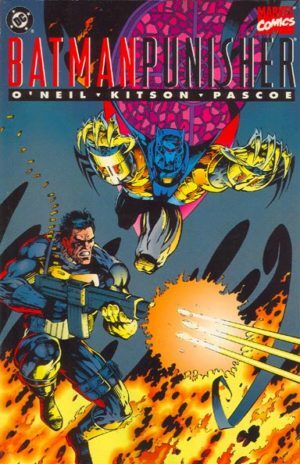 This volume not only collects three late-90s DC/Marvel crossovers, but a handful of WildStorm/Marvel crossovers as well, as by this point WildStorm was wholly-owned by DC. Collects Daredevil/Batman: An Eye for an Eye OGN (1997), Generation X/Gen13 (1998), Incredible Hulk vs Superman (1999) #1, Spider-Man and Batman: Disordered Minds OGN (1995), Spider-Man/Gen13 OGN (1996), and Team X/Team 7 OGN (1996) OGN. 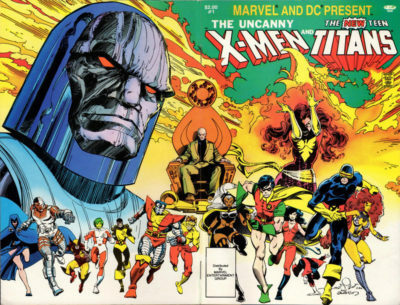 This volume collects the four remaining mid-90s DC/Marvel crossovers -Batman/Spider-Man: New Age Dawning OGN (1997), Darkseid vs. Galactus: The Hunger OGN (1995), Green Lantern/Silver Surfer: Unholy Alliances OGN (1995), and Superman/Fantastic Four: The Infinite Destruction OGN (1999). Collects DC Versus Marvel/Marvel Versus DC #1-4 and Doctor StrangeFate (1996) #1. Avengers/JLA (2003) #2 & 4: See JLA/Avengers, below. This mini-series lead to the 1996 Amalgam titles, which occur between #3-4 of this limited series.. The collection also includes Doctor StrangeFate (1996) #1. Continues to DC/Marvel: All Access. DC/Marvel: All Access (1996) #1-4: Not collected. A followup to the 1996 crossover. Continues to Unlimited Access. Unlimited Access (1997) #1-4: Not collected. The final in a trilogy of DC/Marvel crossovers from the mid-90s. 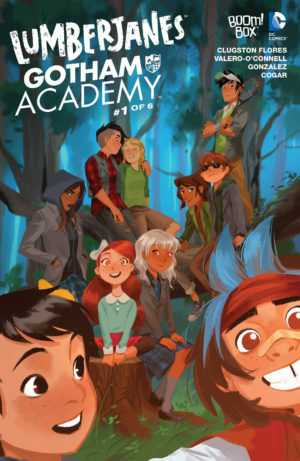 A digital-first title that ran #1-12 (2014) in digital issues and #1-6 (2014) in physical issues. At the time of publication, the Green Hornet license was held by Dynamic Entertainment. A digital-first title that ran #1-12 (2016) in digital issues and #1-6 (2016) in physical issues. A digital-first title that ran #1-12 (2015) in digital issues and #1-6 (2016) in physical issues. 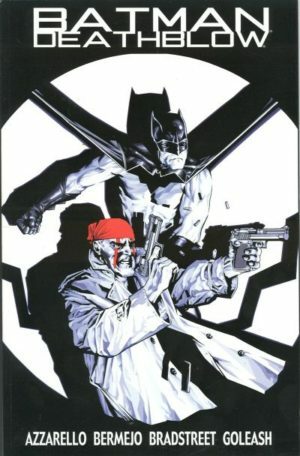 A Batman / The Shadow / The Spirit team-up. Also collects Batman/Doc Savage Special (2010) #1. This issue is also collected in B&W in Showcase Presents: DC Comics Presents – Superman Team-Ups, but I’m not certain it contains the full He-Man story. Worlds Collide (DC/Milestone crossover): See DC Universe Events for details on this direct crossover. Superman/ThunderCats (2004) #1: Not collected. Published as a WildStorm comic. This section is still in progress, but you can expand to see how I\'m doing. #1-5: Vol. 1: Truth, Justice, Pizza! #26-32: Vol. 6: Titans Together! #33-55: Not collected, aside from occasional excerpts in other comics. This period encompasses a monthly digital series issues #1-46 (November 23 2013 – August 3 2017) and physical #1-25 & Annual 1 (February 2014 – February 2018). Collects physical issues #1-6 (digital issues #1-12). Digital issue #5 is also in Teen Titans: A Celebration of 50 Years (2014) hardcover. Digital issue #12 is reprinted in Teen Titans Go!/Scooby-Doo! 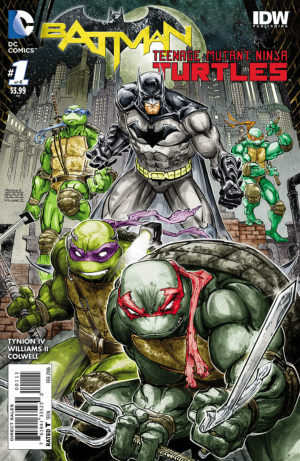 Team-Up FCBD Special Edition (2015). Collects physical issues #7-12 (digital issues #13-24). 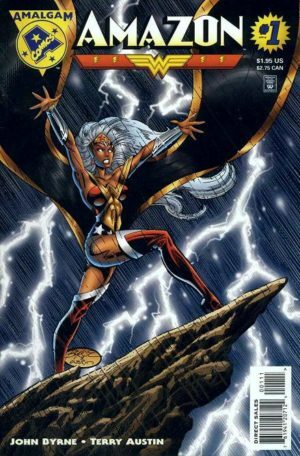 Collects physical issues #13-18 (digital issues #25-36). Collects physical issues #19-24 (digital issues #37-48). Reprints Batman: Arkham Knight (2015) #13-26 (digital) & #5-9 (physical) and Batman: Arkham Knight: Batgirl Begins (2015) #1, which appears in physical Batman: Arkham Knight: Batgirl & Harley Quinn (2016) #1 – but not the other content from that issues. Note that Volumes 2-3 split material from physical issue #9. ReprintsBatman: Arkham Knight (2015) #27-39 (digital) & #9-12 (physical), Batman: Arkham Knight (2015 – physical) Annual 1, Batman: Arkham Knight: Batgirl & Harley Quinn (2015 – digital) #1-2 and (2016 – physical) #1, and Batman: Arkham Knight: Robin (2016) Special 1. Note that Volumes 2-3 split material from physical issue #9 and physical Batman: Arkham Knight: Batgirl & Harley Quinn (2016) #1. This period encompasses digital #1-36 (January 15 2013 – September 17 2013) and physical #1-12 & Annual 1 (March 2013 – February 2014). This period encompasses digital #1-24 (January 7 2014 – September 16 2014) and physical #1-12 & Annual 1 (March 2014 – November 2014). This period encompasses digital #1-24 (May 5 2015 – October 13 2015) and physical #1-12 & Annual 1 (Early July 2015 – Late December 2015). 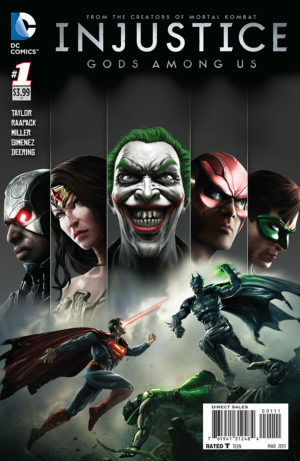 Adapting the events of the original Injustice Game, encompassing digital #1-24 (October 4 2016 – March 14 2017) and physical #1- 12 (Early February 2017 – TBA). Previously collected in a 1996 hardcover and 1997 slipcase hardcover. #33-38: Vol. 6: The Treehouse and Beyond! #45-50: Vol. 8: Aw Yeah Titans!